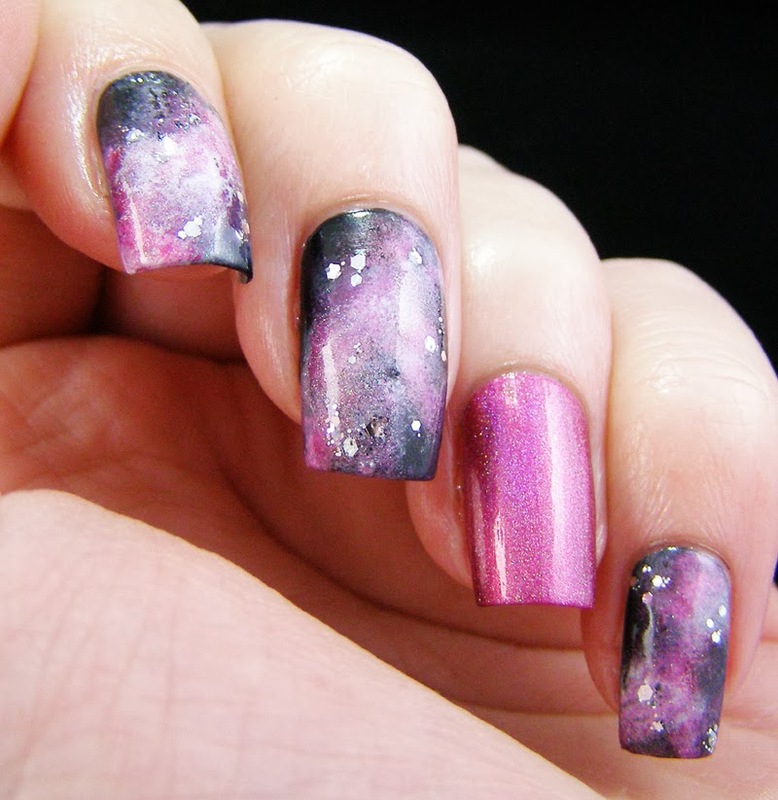 So...its been a while since I've done a galaxy manicure. I really love them, but I try my damnedest not to do the same thing, in the same way, twice. It's just not interesting to me to repeat something I've already done...unless I royally screwed it up the first time (and even then...). I had this epic plan to do a soft and fluffy, ultra-girly galactic manicure. I wanted to do it on a white background...but white polish is so fussy. So I switched it up to black. It gives it just the right amount of edge. I also decided to try hand-placing a few bits of glitter this time to act as stars, instead of using white polish and a dotting tool. I don't hate it, but I'm not sure about it. I think I need to add them in layers, so they don't look like they are floating on top of everything. I also had to add a layer of spectraflair to everything. 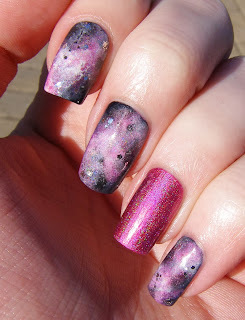 The China Glaze holographics, while beautiful colors, just don't sing like I want them to in the light. Plus, who doesn't like more shiny? The reverse accent was not part of my original plan. My ring finger refused to play nice (seriously, three tries and I give up) so an accent nail was in order. I considered layering Set in Stones on there, but I thought that it might compete with the galactic awesomeness of the other nails. Plus, I didn't want to push my luck...and thus, a simple anti-accent nail was born. And boy-oh-boy, did I use a bunch of polishes. This has to be a 2013 record for me. 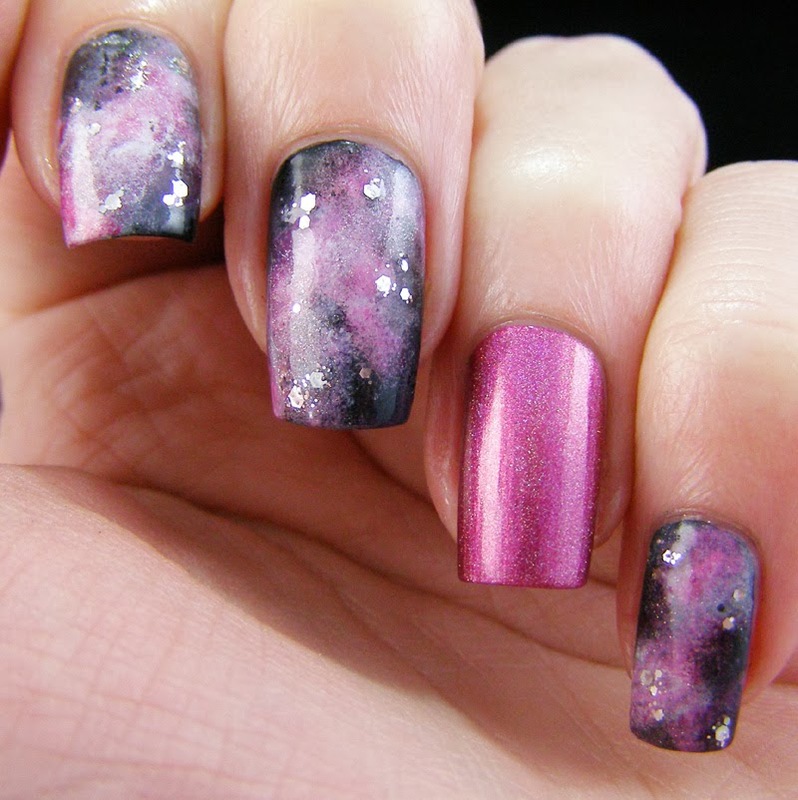 yeah, sometimes an overtly girly manicure is in order!